Le Club AccorHotels has launched new promotion for stays that are both consumed and booked between June 10 – September 10, 2017. Members can earn triple points unlimited times for their stays in Asia-Pacific. Registration for this offer is required. Cambodia, Greater China (including Hong Kong ,Taiwan & Macao), India, Indonesia, Japan, Lao People’s Democratic Republic, Malaysia, Maldives, Myanmar, Philippines, Singapore, South Korea, Thailand, Vietnam, Australia, Fiji Islands, French Polynesia and New Zealand. This offer unlike the one that I wrote about yesterday should be open for all members. ASPAC] The Escape Plan (10 June – 1. General Le Club AccorHotels terms and conditions apply to the “Escape Plan” offer and you must be a Le Club AccorHotels member to benefit from it. 5. Any consecutive stays (check-out and check-in same day) in the same hotel, will be considered as a single stay. 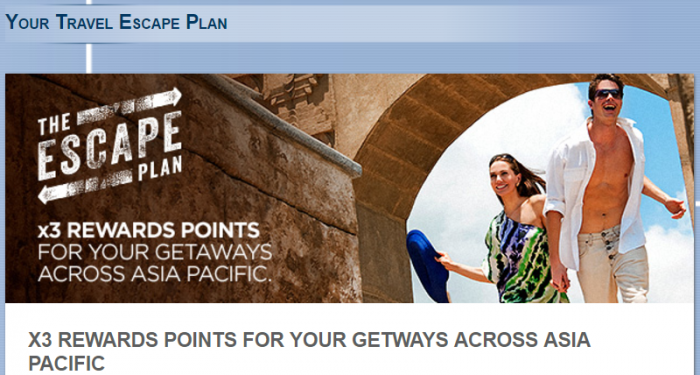 This single stay will be eligible once on the “Escape Plan” offer. 7. To benefit from this offer, stays must be booked via AccorHotels distribution channels (AccorHotels websites, AccorHotels mobile applications, AccorHotels Central Reservations, hotels) and traditional travel agencies using a GDS that is automatically connected to AccorHotels Central Reservations. You are therefore not eligible for this offer if your stay is booked with a retailer, a tour operator or a third-party online travel agency (such as expedia.com, booking.com, etc.). 14. You must register for the “Escape Plan” offer before proceeding to the booking, to be eligible for the offer.